Steel Tycoon Lakshmi Mittal, the 64 year old non resident Indian living in Kensington, London, is the fourth richest person in the world, with a personal fortune of US$45.0 billion according to Forbes magazine. 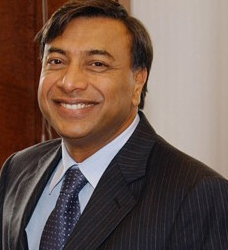 The Financial Times named Lakshmi Mittal its 2006 Person of the Year. This London-based Indian billionaire industrialist, was named one of the "100 most influential people" by Time magazine in May 2007. He was also listed as the richest person in Britain in the Sunday Times Rich list 2005. Since 2005, Mittal has been the richest person residing in the United Kingdom, the richest person in Asia and the 4th richest person on the planet. He is the President of the Board of Directors and CEO of Arcelor Mittal, the world's largest producer of steel. Arcelor Mittal is the combination of the world's number one and number two steel companies, Arcelor and Mittal Steel. Lakshmi Narayan Mittal alias Lakshmi Niwas Mittal was born on June 15th, 1950, in Sadulpur, a village which didn't have electricity until 1960's, in Rajasthan, India. His family moved to Calcutta in West Bengal, where he studied accounting and business at the prestigious St. Xavier's College. His father Mohan Lal Mittal had set up a small steel mill in Calcutta. After class, Mittal used to work in his father's company. After finishing his Bachelor of Commerce degree in business and accounting with first class, Mittal began his career in his father's steel firm in the early seventies. Realizing the fact that opportunities in India are limited for him, Mittal moved to Indonesia in 1976 and with his father's backing founded a steel plant, Ispat Indo and made the company a success. There began a saga of triumphs for the shrewd businessman. His success has largely been built on buying up loss-making state-owned mills and quickly turning them around. He had one of his most notable successes in the late 1989, when he turned around a loss-making government-founded steel firm in Trinidad and Tobago which was losing $1 million a day. Within a year, Mittal had doubled the output and made the business profitable where US consultants and German experts failed to find a solution. In 1992, he went to Mexico and bought the country's third largest steel producer, Sicartsa for $220 million. This was followed by an acquisition of Siderurgica del Balsas SA at Lazaro Cardenas in Mexico and then more companies in Canada, Germany, Ireland etc. Mittal followed the same strategy in former Soviet republic of Kazakhstan, and took over the state-owned blast furnace steel plant in 1995, renaming it Ispat Karmet. It was a risky proposition even by Mittal's standards, workers had not been paid for six months. But within a year it was profitable and production has doubled from 120,000 tons a month to 250,000. In 1995, two new companies Ispat International Ltd. and Ispat Shipping were formed to provide technical and commercial services to the Group and to meet its growing shipping needs. The same year, he entered into Europe by acquiring a steel plant in Hamburg, Germany. With this, the capacity of the group reached to 11.2 million tonnes. Meanwhile in 1994, a partition in the family business group, transferred all the foreign business into Ispat International, under the control of Lakshmi Mittal. The Indian operations remained with his younger brothers P K Mittal and V K Mittal. In 1997, Ispat International, the company that controlled the Group's steel making operations in Mexico, Trinidad and Tobago, Canada and Germany went for listing in 1997 on the New York and Amsterdam stock exchanges. The Ispat group went on making major acquisitions. In 2004, Mittal Steel was formed through the merger of Ispat International and LNM Holdings, at the same time Ispat International merged with International Steel Group Inc. (ISG) an Ohio based company, becoming the world's most global steel producer with a net worth of over $22 billion. Mittal's industrial empire has steel making facilities in 14 countries and stretches from Indonesia to Poland, via Mexico, US, South Africa and Trinidad, North America, Africa, Asia and many European countries. In 2006, after six months of negotiations and major oppositions Mittal steel took over European steel giant Arselor SA for 26 billion euros ($33 billion), becoming the world's largest 100 million tonne steel entity. The merged entity would be called Arcelor Mittal with the Mittal family owning 43.6 percent of the combined group. Mittal has received accolades for his achievements. In 1996, he was awarded the title 'Steel maker of the Year' by New Steel Magazine in the USA, and he received the Eighth Honorary Willy Korf Steel Vision Award, the highest recognition for world wide achievement in the steel industry in June 1998. The award was presented by the American Metal Market, a specialised publication, and Paine Weber's World Steel Dynamics in New York., for outstanding vision, entrepreneurship, leadership and success in global steel development, from the American Metal Market and Paine Weber's World Steel Dynamics. In 2004, he was awarded the 'European Business man of the year' by Fortune Magazine. Although steel manufacturing remains the group's mainstream business, they have diversified into shipping and has ventured into coal, power and oil enterprises in Kazakhstan. Mittal is an active philanthropist and a member of various trusts. The LNM Group Foundation was created in 1998 to support health and education needs of the poor, particularly in India. He resides in a palatial home known as Summer Palace, in London that he bought in 2003 for a residential record of $129 million. On the rare occasions when he is at home, Mittal keeps a disciplined schedule, doing yoga for an hour every day and trying to catch a swim in his indoor pool. His wife Usha runs the Indonesian business and his son Aditya and daughter Vanisha are members of the Board of Directors of Mittal Steel. The business empire has also been in the news for showering money on his two children. His daughter Vanisha's wedding to Delhi-born investment banker Amit Bhatia in 2004 June is reputed to have cost more than $55-million, with five days of events at some of France's most famous settings, including the 17th century Vaux le Vicomte chateau. For the wedding of his son Aditya in 1998, the Mittal family celebrated at Calcutta's Victoria Memorial, home to mementos of Britain's rule over India.